The Sony Xperia go has a small, low-resolution screen and can be sluggish to use, but its water and dust-resistant capabilities are impressive. The key feature of the Sony Xperia go is a water and dust resistant rating of IP67, the highest industry level rating. Sony says the Xperia go can survive underwater at a depth of up to one metre for around 30 minutes. That should be enough to ensure it won't be pronounced dead after a quick swim in the backyard pool, but it's not enough to take it into the ocean with you, in case you had any ideas. Motorola's Defy phones, the original Defy, the Defy+ and the Defy Mini, are the only other rugged Android phones sold in Australia so the Xperia go doesn't have too much competition in this space. The Xperia go definitely lives up to its claims. We ran it under a tap, dunked it in a large glass of water and threw it into a full sink and each time it survived without any issues. In addition to its dust proof and water resistant capabilities, the Sony Xperia go has a feature called "wet finger tracking". This means the phone will work perfectly when either the screen or a user's fingers are wet. In demos of the phone, Sony used the example of text messaging in the shower or preparing dinner in the kitchen as two real-life scenarios where this feature will benefit users. In our test period the touchscreen responded to our finger presses and was responsive even when dripping with water, so the feature works as advertised. Many rugged or water resistant smartphones are significantly thick but the Xperia go bucks that trend. It's one of the most compact smartphones we've reviewed this year, measuring less than 10mm thick and weighing a mere 110g. It's also very well designed. We particularly love the grippy feeling plastic on the back and sides, which makes the phone very easy to grip and hold. The go feels superbly constructed, too. There are no creaks or rattles and the phone feels like a solid block of plastic even though the rear cover is removable. To achieve an IP67 water resistant rating, Sony was forced to use plastic flaps to cover the headphone jack and the micro-USB ports. We're normally not huge fans of these types of flaps, but we are happy to make an exception here due to the circumstances. Keep in mind that if you dunk the Xperia go in water without these flaps closed then don't expect the phone to survive. The Sony Xperia go has a 3.5in LED backlit touchscreen with what Sony calls its mobile Bravia engine. This feature promises image noise reduction, along with sharpness, colour and contrast enhancements when viewing images and video. We found the screen a little cramped for day to day use, with the keyboard in particular quite small when typing text messages and e-mails. The low resolution of 320x480 also means the Xperia go doesn't display overly crisp text, either. The Xperia go's screen offers good colour reproduction and reasonable brightness, but viewing angles are poor. Sony admitted earlier this year that it is disadvantaged when releasing smartphones with outdated Android software but the Xperia go is another example of this, shipping with the 2.3 Gingerbread version of Android. Sony says the phone will be upgradeable to Android 4.0 Ice Cream Sandwich by the end of the year, but ICS isn't even the latest version of Android anymore, so the delays are unacceptable. Given the Xperia go's positioning as a relatively cheap post-paid smartphone, however, the lack of Ice Cream Sandwich software is a little easier to take, especially when Sony's UI overlay is one of the best we've used. There are some very appreciated features including an app draw can be sorted by multiple parameters, a lock screen allows you to swipe directly into open the camera and immediately capture a photo, and Sony's intuitive quick settings widget and power saver apps. The only real downside is Sony's and Optus' insistence of preloading the Xperia go with so many apps, most of which are useless. There are 16 Optus apps in the app drawer, most of which you'll never use. Some of these are merely links to Web pages, while others like the Optus Smart Safe service are dedicated applications. Either way, the bloatware is way over the top and most of these apps can't be uninstalled until the phone gets an upgrade to Ice Cream Sandwich. The small 3.5in screen also means Sony's default keyboard on the Xperia go is small and cramped. The inclusion of Swype like functionality that allows you to draw over letters to type does help immensely, but we found it less efficient than Swype. The Sony Xperia go offers reasonable performance but there are times, often when using basic features, that the 512MB of RAM seems limited. We wouldn't exactly describe the phone as slow but it's certainly not fast, either. Sony includes 8GB of internal memory and there's a microSD card slot, too, though you'll have to snap off the back cover to access it. The Sony Xperia go has a 5-megapixel camera that captures decent, but not outstanding photos. Image noise was prominent in most of our test shots, though we were impressed with the detail level and the camera's ability to capture macro shots. Both the camera and the video recorder can be used underwater, which is a really interesting feature. The video recording offers stable performance though the autofocus feature can be a little slow if you're constantly moving. Unfortunately, the Xperia go lacks a front-facing camera for video calls and self-portraits. We think this is a disappointing omission given its rugged capabilities. The Xperia go's battery life is perhaps its most impressive feature. We easily managed to pump out a full day of use out of the phone before it needed recharging. We suspect most users should be able to slightly better that given we consider ourselves heavy users. 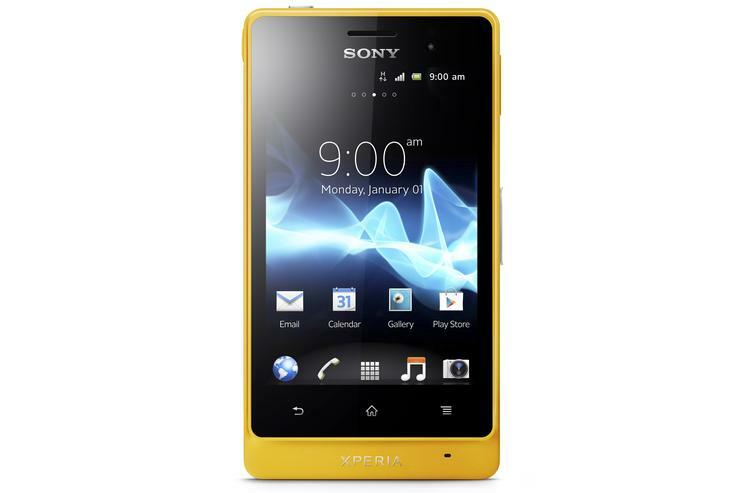 The Sony Xperia go is available in warm yellow or black colours. It sells through Optus, Telechoice and Allphones stores across Australia.